Product: Mashers Kubik 120ml Mini Disposable Plastic Square Dessert Cup Shot Glasses – Packs of 50 was added to cart. A party essential, Mashers Mini Disposable Plastic Square Dessert Cups are perfect for serving amuse bouche, miniature desserts, jelly shots, and canapes at buffets, banquets, receptions and birthday parties. 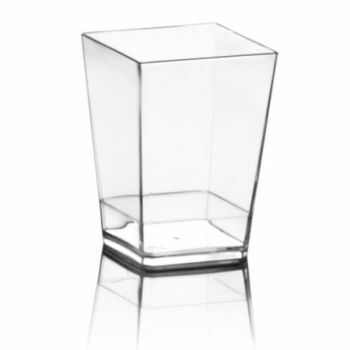 Strong and durable, they are made from clear food grade plastic, have a capacity of 60ml, and they are available to purchase in packs of 50 or 500 for both individuals and catering professionals. Washable, reusable, and fully disposable, they are a great investment for any occasion or celebration.